Google’s Android, Apple’s iOS and Microsoft’s Windows software, along with Facebook and Twitter, each interpret the emoji “alphabet” with slight but significant differences. Those clapping hands and squinting smiley faces aren’t the universal language the world trusts them to be. They are tech firms’ personal IP and branding tools, and they can be highly irregular and even confusing as a result. This phenomenon goes by different names: the “emoji gap,” the “emoji barrier” or, my personal favorite, the “emojumble.” If the issue had a mascot, it’d be the hairy heart emoji, " " that appears on Androids when an iPhone user sends a “ .” Consider yourself forewarned. Davis explained that to create this reference list, Unicode first needed to consolidate three different emoji “fonts” created by Japan’s largest telcos -- Softbank, KDDI and DoCoMo, which invented the colorful little symbols. Unicode's master set had to select a single reference illustration and name to accompany each emoji, so " ," for example, became the guide for "face with look of triumph." 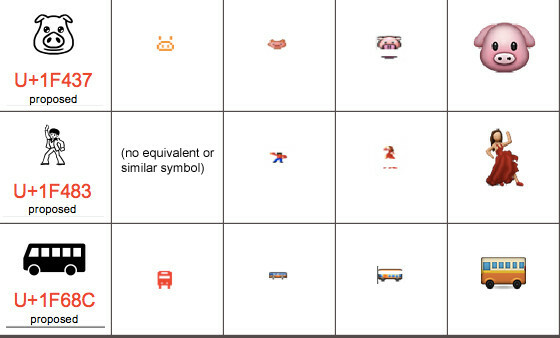 Photos from a 2010 Unicode document, showing a draft of the images the nonprofit organization considered as it attempted to reconcile the Japanese emoji into a single master list. The columns, from left to right, show: Unicode's proposed symbol, DoCoMo's version of that emoji, KDDI's version and then Softbank's. The last column on the right is Apple's symbol. Apple’s emoji font -- repurposed by tattoo artists, sculptors and even other tech giants -- has become the most iconic of all the "alphabets," surpassing even Unicode’s standard. Yet a closer inspection reveals a set of symbols shaped by corporate interests. The first Apple emoji arrived on iPhones sold in Japan, which then operated exclusively on Softbank’s network. 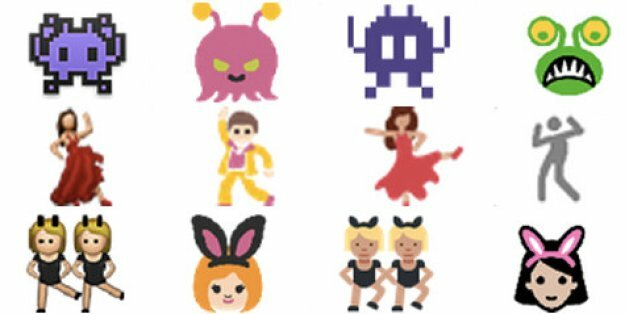 Given this alliance, it’s little surprise that Apple’s emoji hew to Softbank’s designs: Like the Japanese carrier's emoji, the Apple version of “woman with bunny ears” features two girls dancing; its “alien monster” resembles a retro, PacMan-esque purple critter; and its “dancer” is a woman, arms outstretched, in a red dress. Even in their rush -- or perhaps because of it -- Apple found opportunities to turn emoji into branding opportunities for the mothership. The emoji for “headphones” is Apple EarPods. The two calendar emoji match Apple’s Calendar app. And every smartphone-related emoji pictures a device that evokes the iPhone. From left to right, emoji designed by Unicode, Apple, Google, Twitter and Microsoft. To make things even more confusing, Android's emoji can vary from version to version, or from phone to phone. Other companies are guilty of the same, tweaking emoji to make the expressive illustrations stay consistent with whatever they consider their corporate image. Android’s early emoji superimposed emotions onto its green mascot, so feelings of happiness or frustration had to be acted out by the official Android robot (“Please don’t break up with me .”) The emoji for hand gestures offered by Facebook are drawn to resemble the white hand that appears on the social network's omnipresent "like" button. Microsoft’s font manager Si Daniels -- who includes a where Davis had a -- said Microsoft was so keen to have its emoji reflect the look and feel of its smartphone software that the company redesigned its emoji twice in two years. One set of emoji debuted with the Windows 7.5 software, in 2011. The next year, Microsoft scrapped those and started over when it tweaked Windows' appearance and branding. From left to right, the "alien monster" emoji designed by Unicode, Apple, Google, Twitter and Microsoft. "When we made our [emoji], we followed the Unicode design quite closely, but also instilled in it the Windows design principles that were emerging at the time: solid colors, stylized, simple without textures or gradients or fake effects," said Daniels. By comparison, Apple’s iconic emoji are horribly out of fashion. Its icons have shadows, depth and a three-dimensional look that’s a holdover from the Steve Jobs era of skeuomorphic design. Flat illustration free of texture or highlights is now de rigeur. Apple has already abandoned the faux-wood paneling and leather elsewhere in its software, and its emoji could change at any time -- potentially a rude shock for those who’ve come to identify with the brand's symbols. “I kind of hope they don’t [change it]," said Van Lancker. From left to right, the "dancer" emoji designed by Unicode, Apple, Google, Twitter and Microsoft. Microsoft is already at work updating theirs. Unicode recently published a chart plotting its emoji illustrations next to each companies’, and Daniels has “font consultants” rethinking some of Microsoft’s designs. The carousel horse is already a likely contender for a smiley facelift. “We said just last week, ‘Well, do we need to change the direction of our carousel horse because it’s different from the others?’” -- Microsoft’s faces right, the others all face left -- “Then we were thinking, ‘Well, do carousels all go in the same direction? Are we right and everyone else is wrong?’ And we started doing research into what direction carousels run, and apparently they all do go in the same direction, with one or two notable exceptions,” Daniels said. Microsoft's carousel, on the right, compared to the same emoji from other tech companies. Minor as it might seem, a standard direction matters as messages move from one software system to another. Mess that up, and a text about a dog chasing a car could turn into a car running down a dog. So I asked Daniels: Is Microsoft's carousel wrong? Not long after hanging up the phone, I got an email from Daniels.